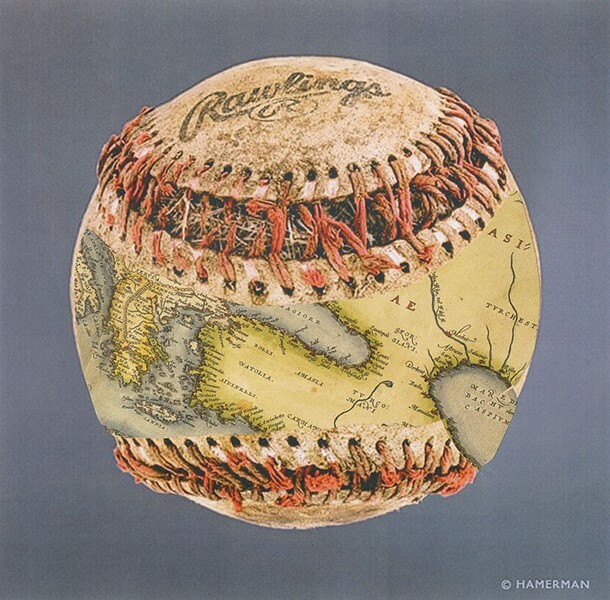 One of the earliest maps to show the Earth as a sphere was apparently grafted, by some process, onto a baseball. The ball, fished out of the Aegean Sea by a Greek trawler, was later purchased at a yard sale in Lesbos, coincidentally enough, by a cameraperson for "Antiques Roadshow." 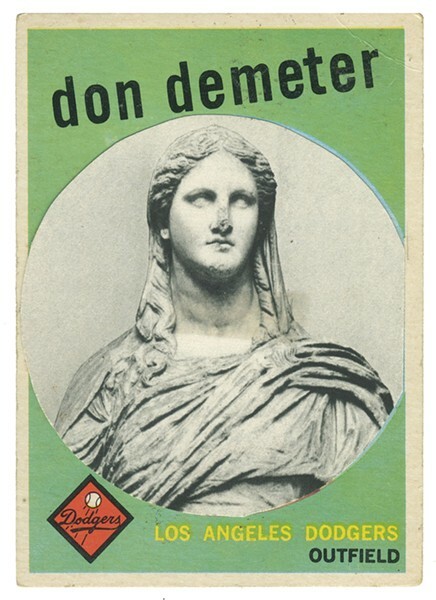 Alas, in deplorable condition, it sold for a mere five drachmas. 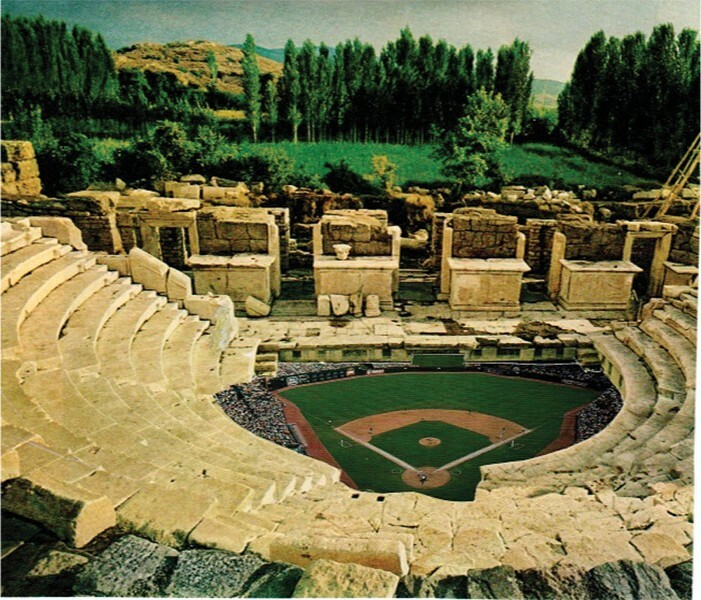 The Delphi Dolphins (later the Delphi Dodgers) played in this stadium throughout the Age of Classical Myth. One of the most memorable moments in the history of this park occured when Phobeus "Big Papi" Apollo threw a pitch that got away from him and killed the star slugger of the Oracles, Ty Python. For well over a century now, baseball and the month of April have been happily intertwined. After a punishing winter, in which we paid court to cardiac arrest by shoveling immovable mounds of snow, or slogged through slush to free a Civic entombed in a dolmen of ice, we suddenly joy, one day, to the Eternal Return of Spring: a vee of Canadian geese heading north and a flock of Baltimore Orioles heading south. 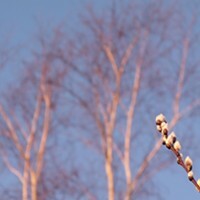 Yes, in this fourth month, which brings to mind the timeless cycles of the natural world—the budding of trees, the melting of streams—it is well to consider the timelessness of baseball, too. 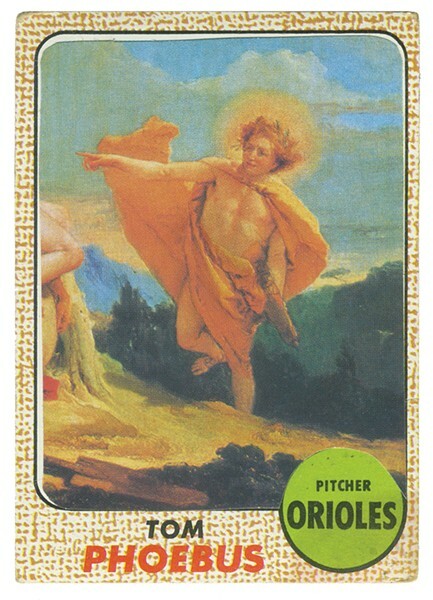 Baseball card featuring one of the immortals who played for the Delphi Dodgers. Historians generally agree that the first officially chronicled baseball game, pitting the New York Ball Club against a team from Brooklyn, took place in Hoboken, New Jersey, on October 21, 1845. But the very site of that long-ago contest—the Elysian Fields, named for that rest area of the Underworld where the immortal heroes of Greek mythology reside in a state of interminable ennui—provides a clue as to the true antiquity of the game. Likewise, the rare photos that accompany this text (courtesy of the Royal Library of Alexandria) are further proof that baseball was known to, and held sacred by, the ancients, East and West. Boys of summer, meet the boys of Sumer! 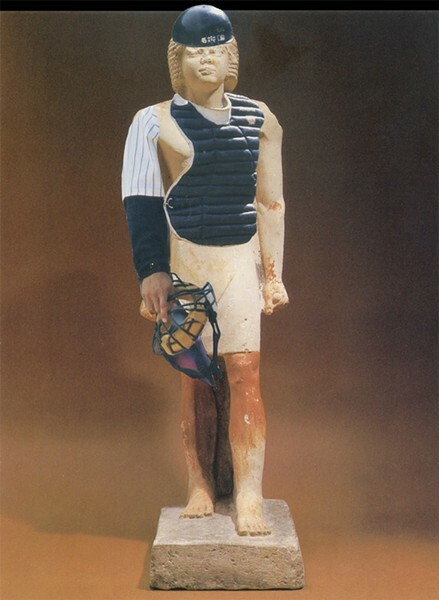 Scholars, mostly untenured, believe this ancient Egyptian funerary figure depicts a catcher for the Karnak Cubs.